I launched DCHomePrices.com in January 2006 to make it easier for home buyers and sellers to see what homes are selling for in their neighborhoods. I thought that displaying home sales records on a map would make it easier to research the housing market instead of the time "honored" practice of perusing pages of home listings provided by a real estate agent. 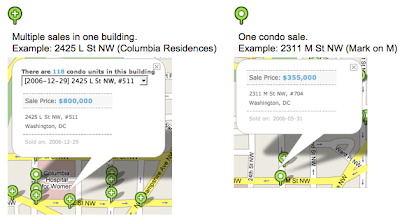 DCHomePrices.com did not provide information on condo sales in the District, which somewhat limited its usefulness since condos comprise more than half of all housing sales in the District. I'm fixing that omission with the launch of DCCondoPrices.com. 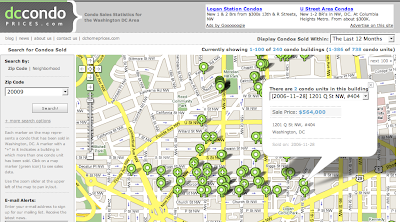 Just as you can at DCHomePrices.com, on DCCondoPrices.com you can search condo sales for up to the past 12 months. You can search by zip code and by neighborhood. There are two types of map markers, one for a single condo sale and one for multiple sales in one building (see below). The site is still in BETA, there are a few bugs to work out, but check it out and kick its tires.